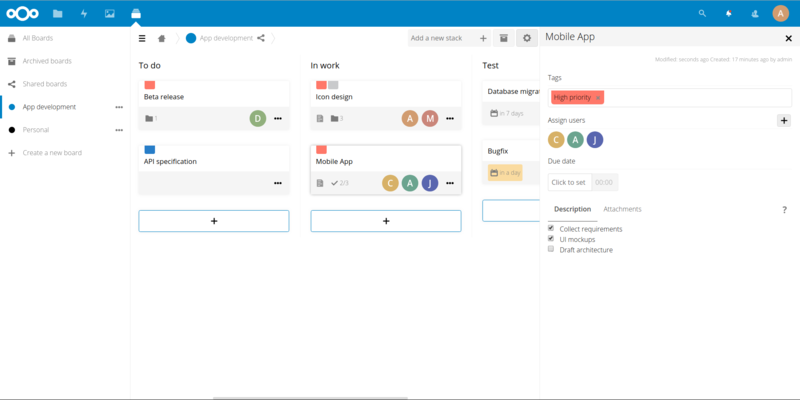 Deck is a kanban style organization tool aimed at personal planning and project organization for teams integrated with Nextcloud. :family: Integrates with the Circles app! This app is supposed to work on the two latest Nextcloud versions. Instead of setting everything up manually, you can just download the nightly builds instead. These builds are updated every 24 hours, and are pre-configured with all the needed dependencies. Nothing to prepare, just dig into the code. Please read the Code of Conduct. This document offers some guidance to ensure Nextcloud participants can cooperate effectively in a positive and inspiring atmosphere, and to explain how together we can strengthen and support each other. For more information please review the guidelines for contributing to this repository. All contributions to this repository are considered to be licensed under the GNU AGPLv3 or any later version. For further information on how to add or update the license header correctly please have a look at our licensing HowTo. Use your real name (sorry, no pseudonyms or anonymous contributions). If you set your user.name and user.email git configs, you can sign your commit automatically with git commit -s. You can also use git aliases like git config --global alias.ci 'commit -s'. Now you can commit with git ci and the commit will be signed.